It’s been a very social week, with an activity-filled weekend to round off my first week of UTMB training. Trail runs all week with great company, starting with a loop with Paulina the Ultrababe on Wednesday. Thursday was a night trail run with Keith aka “Buzz Lightyear”, visiting from Oz. Another ultra-nut with the biggest, smiliest personality on the trail. We got out the headlamps halfway through our run, and I now realise I need to get a brighter headlamp if I’m going to do anymore night runs! 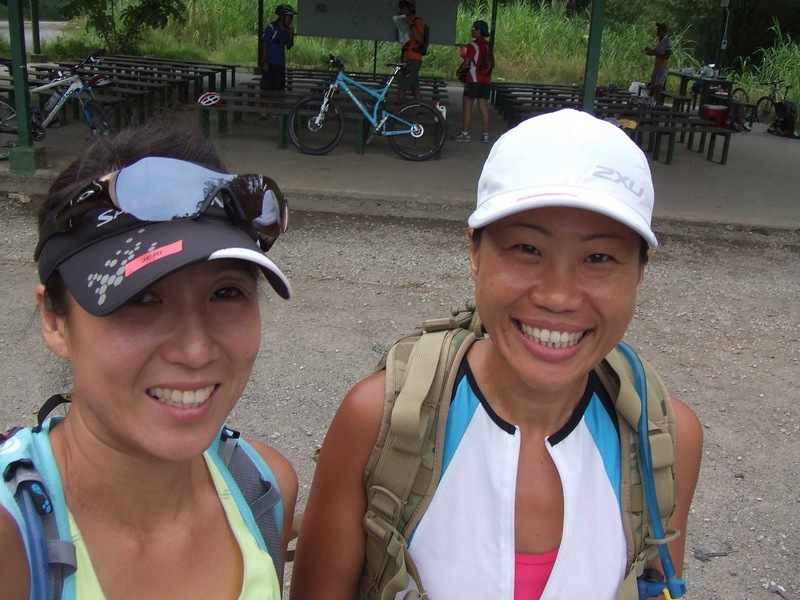 Hit the trail on Friday morning again with Marnie, fresh back from the Tokyo marathon and in training for the Great Wall Marathon (GWM) coming up. We ran (mostly) up to the top of the Jelutong Tower for good measure, seeing as we’re both in need of some stair training for the GWM (Marnie) and The North Face 100 Oz (me). Nice view from the top! Ended up doing a solo run on Saturday due to a very late night out on Friday .. apologies I didn’t make the morning run, Patrick! Nonetheless, cranked out 15 miles on the trail with a full pack … I think the boys are feeling marginally lighter … although my new pack will need some modifications to stop some chafing at the back of my neck. Nothing new there, had to do the same with my old pack. Longest run to date in a skirt, no complaints so far! I’m thinking the running skirt could be made of a lighter material and maybe a little shorter for racing, but I’ll experiment with a couple of things I have in mind and report back later. Pic below were taken at the tail end of my 15 miler .. the rest of me was drenched in sweat from the heat and humidity, but the skirt still looks pretty perky, no signs of sticking to the legs either. Tried to collect the race pack for the 2XU Compression Run that afternoon, but the queue was crazy and stretched all the way round the basketball court outside Velocity .. come back later! So then it’s off to the Edge Adventure Clinic for a navigation crash course … Paulina rocked up as well and we had a bash at being Topo Queens … with varying levels of success. We learnt to read a compass and work out our bearings on a map, starting with a few practice checkpoints to make sure we got the general principles right. We all did the first one together, and then checked the map to locate CP2. Er .. which arrow am I supposed to follow??? Wilson (the instructor) then told Paulina and I to lead everyone to the next practice checkpoint .. and I managed to lead everyone through a lovely muddy overgrown trail only very slightly off course. We then had a quick lesson on how to rectify having overshot the CP, and finally found it after a little searching and several dozen mosquito bites. I’m off to a good start for Sabah, then! After I led everyone though the mud ..
We then decided to go off on our own to try the first 4 CPs and had a whale of a time second-guessing ourselves when it came to choosing routes on the map. We found all 4 CPs without too much deviation and thought we’d call it a day before it got dark. However, I might have to go back again on my own for some extra practice .. I don’t think Sabah will be as simple as this! Managed to collect the 2XU race pack just before the booth closed .. no thanks to a very dim taxi driver who had no idea how to get there. Then off to the ECP to give the Twilight runners a little support .. after we’d scoffed a stack of Ah Hwee’s chicken wings, of course! The runners had been going for 6 hours when we got there, and over half had called it a day. The remaining runners were plodding on steadily .. well done to everyone for hanging in there! 16 hours on a flat 10k loop is no mean feat. So all in all a good week, and looking forward to another one!